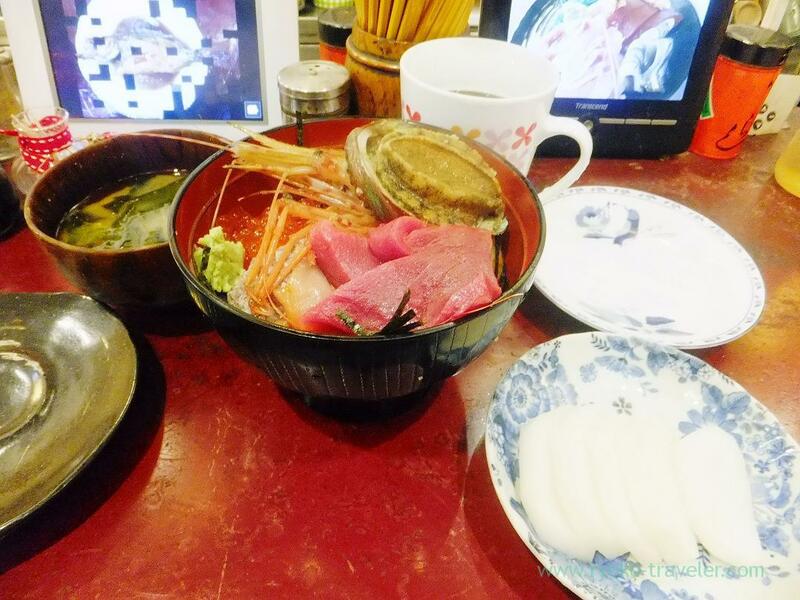 Tsukiji Market takes year-end holidays from 30, tomorrow. And so many people have New Year holidays from today, so Tsukiji Market was completely packed with people who buy something for New Year events, who want to see such a crush of Tsukiji, who don’t have any schedule and come to Tsukiji to eat something. Anyway, Tsukiji was crowded with people who were in New Year Holidays. Today, Yonehana was fully packed, too. I managed to secure seat at a very narrow space. The waiter said to me that they didn’t have Sashimi bowl (海鮮丼) only. So, I ordered it. But after ordering it, I was anxious about its price. I didn’t know the exact price. “2000 yen ? 2500 yen ? I have 2000 yen only… “, said in my mind. I checked the menu and I found that it cost 2000 yen. Wooow. My sashimi bowl came soon. This size of tuna is so funny. Don’t you think ? As you see, so thick ! Though you can’t see by the picture, it had herring roe in special because New Year will be soon. Herring roe is necessary with New Year dishes. The texture of soft roe was great and mantis shrimp was tasty. Botan shrimp was huge and its innards tasted sweet. The abalone tasted like sea. 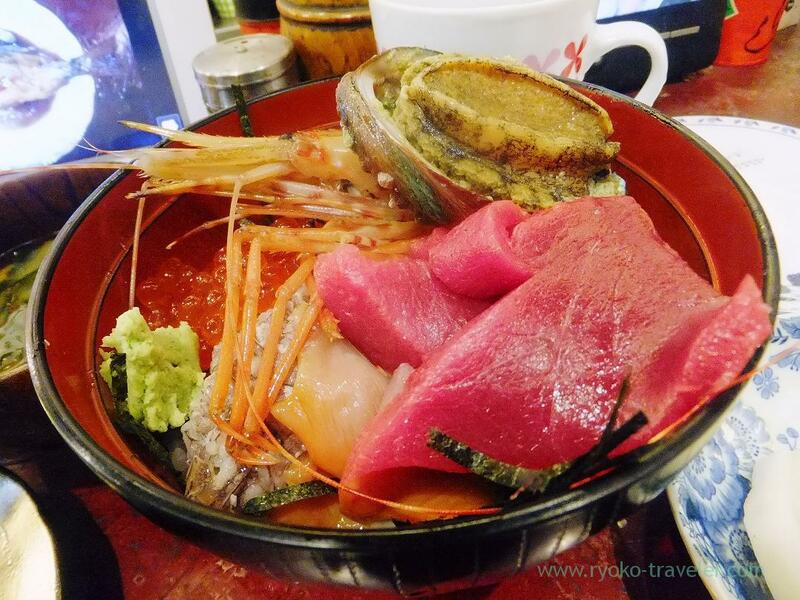 I was astonished that Yonehana rose the price of sashimi bowl from 1500 yen to 2000 yen this April. 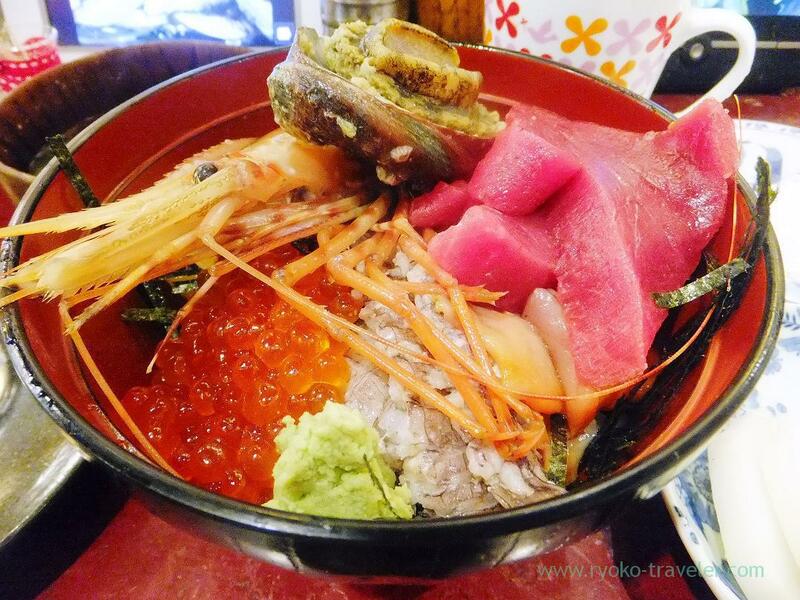 But I understand because the quality of sashimi bowl is also rise too. I was glad to go to Yonehana last of this year. Hi Ryoko, hope you’ll recover fully to enjoy more yummy foods during the new year! By the way, do i see something like akagai under the thick tuna slices?